Where is the war of words heading? North Korean leader Kim Jong-un on Saturday praised nuclear weapons as a "powerful deterrent" which guaranteed his country's security, state media reported. In a speech addressing "the complicated international situation", he said such weapons had safeguarded "the peace and security in the Korean peninsula and north-east Asia" against the "protracted nuclear threats of the US imperialists". He said his country's policy of simultaneously pursuing the development of nuclear weapons in parallel with moves to strengthen the economy was "absolutely right". North Korea recently launched two missiles over Japan and defied international condemnation to carry out its sixth nuclear test in September. It has promised to carry out another test in the Pacific Ocean. There are fears in the West that is rapidly reaching the point where it is capable of developing a nuclear-tipped missile that could reach the US mainland. Saturday's tweets by President Trump are another cryptic announcement by America's leader, the BBC's Laura Bicker in Washington says. Last week, it was suggested that US Secretary of State Rex Tillerson had direct lines of communication with Pyongyang to try to resolve the escalating tensions. On Saturday, the US president insisted he had a good relationship with his secretary of state, but added that Mr Tillerson could be tougher. Earlier in the week, Mr Tillerson had denied rumours of a rift between the two men, amid media reports he had called the president a "moron". 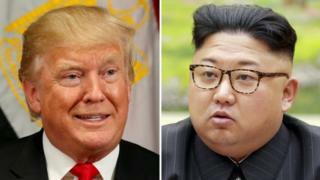 Mr Trump's latest comment on North Korea could just be bluster - but the fear is that Pyongyang will interpret it as a threat, our correspondent says.